When you’re binging an engaging show on Netflix like Narcos, you might want to skip intro song or the recap after a few episodes. There’s no easy way to do that on the web apart from skipping a few minutes on the scrubber. Thankfully, Netflix Extended extension for Google Chrome removes intros and recaps. 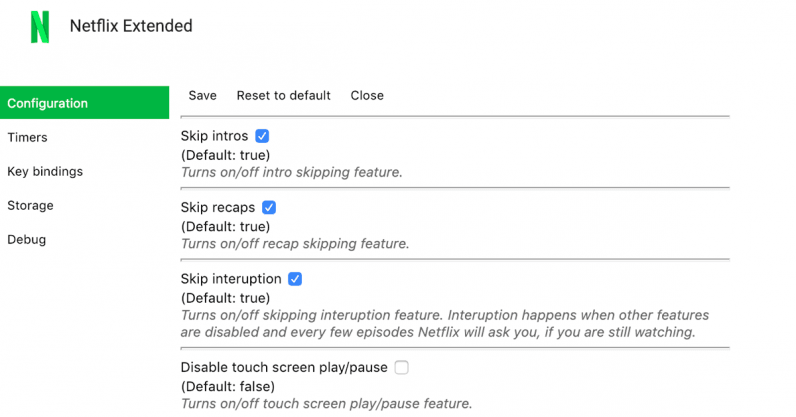 Not just that, it enables a quite a lot of useful keyboard shortcuts and features for a powered-up Netflix experience on the web. Apart from the keyboard shortcuts, the extension enables some really useful features like muting trailer’s audio by default and disabling play/pause with a touch screen. But my favorite’s gotta be the one that pauses the video if you switch to another tab. You can change the setting to pause the video if the window’s not in focus. This comes really handy when you’re attending a call, or switched tabs to check email. You can install the Netflix Extended extension from here.